Rain's Garden: The Countdown Begins! And here it is! 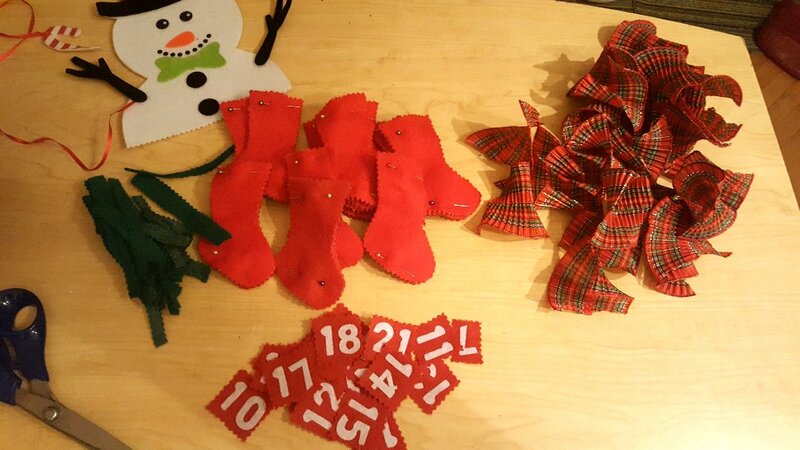 :) I have to say though, sewing 24 little stockings together made my hands ache, but I'm so glad I got it done, I would have regretted not making one this year. Excuse the low lighting of the photos today, I'm still in migraine territory so the curtains are drawn and the lights are very dim still. It's almost gone though, the pain is very low, but my head feels a little "floaty". That usually means I have a few more days to go. I should be better by Monday though. This was a long one! Dinner time chez moi. The dogs are continuing to come together as a pack. And they are loving the snow. It's so nice to see them playing all together, finally without any scary fighting between the alpha girls! Love the "bottoms up"shot, it was like that in my house for several years when i had 3 Spaniels and 2 cats. The cats were in charge needless to say really. 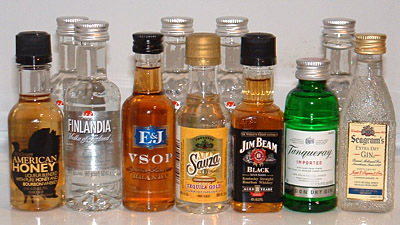 My uncle used to collect those mini booze bottles. He had, like, a million. cute Advent calendar! Stay warm, it was 6c in Toronto today, went for a nice walk. We are still at almost fall temps right now - 21 C in the days and 10 C at night. The advent calendar is very nice. The girls just get one from Cost Plus with the little chocolates inside. I like your advent calendar, I wish I was more crafty but H likes the boring old chocolate one anyway! Glad to hear the migraine is almost gone but sorry you had to have one at all. Have a great weekend! We are decorating our tree tomorrow. My you've been creatively busy! Good for you! And what a great dinner shot! Wish our cats got along so well. I love your advent calendar! That is so adorable. I never thought to make my own. What a neat idea. How wonderful that the dogs are all getting along so well. That must be such a relief. Now if only humans could do the same...LOL My weekend will be quiet. Today I'll be meeting up with my brother in Vaudreuil for coffee and a chat. In fact, I'll be out the door within half an hour. Have a super weekend! The liquor filled candy is a wonderful Idea. The kids calendars however are filled with goodies and little surprises. We are headed out to the christmas parade and christmas train today. No big deal since we are in a tiny town but there are little bake sales and craft markets all over town so I am sure it will be a nice outing. Tomorrow will be the 1st advent already. Time is flying this year. I wanna get out and get a little tree cut for the porch outside the living room window. We'll see if I will get to it. We haven't ever made advent calendars. Until I watched a show called "Bad Santa" on tv a few years back, I had never heard of them. They seem like a fun idea though. Went to town today and bought a bag of cat food, that's been the highlight of my week I'm afraid. 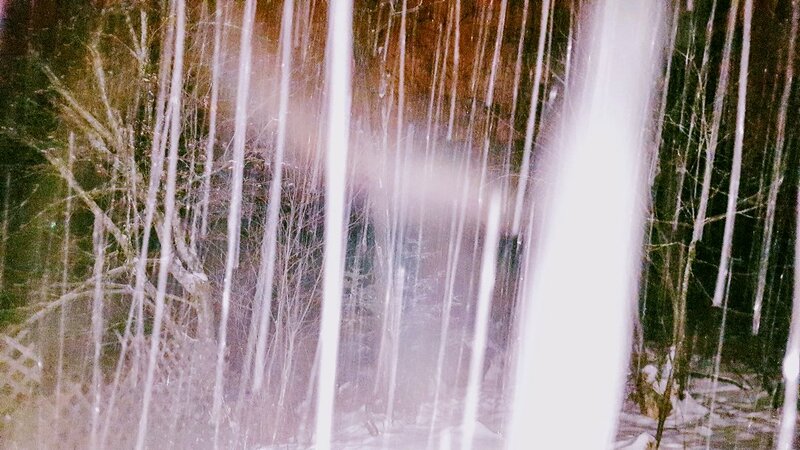 That photo does look sort of creepy and I love a good snowstorm! You are amazing to 'whip up' that gorgeous Advent Calendar while dealing with a migraine too! Your ideas are great especially for the little booze bottles but are they really that expensive now? Whoa Nellie! It's been years for me too. I used to buy them for recipes that called for some kind of alcohol as I don't really drink hard liquor...much! LOL! I can't believe you made that calendar....it is so cool! It's amazing your 'pack' get along so well eating that close to each other. I put Nitty and Annie on opposite sides of the room but they share dry food and water. Annie has food insecurity issues and Nitty is so good she lets her have her way...Annie always has to be the first when I put new food or water out and Nitty (the Rottweiller) waits patiently while the mini-dachshund gets first dibs. Nitty could definitely shove her out of the way but she doesn't. It's like she understands and gives her a 'pass'. Your dogs are amazing...along with their mistress! Love the dinner line-up! My two are at opposite ends of the house - each inhales their food and looks for more. It's a good thing you only need about two hours of sleep - or so it appears, given the quantity and quality of your creative output! Love the Advent calendar! Hi Laurie (by the way, I love the new Avatar! nice to see you!!). The back of of the fur babies lol...that made me laugh! Thanks, I enjoyed making the calendar! It was different from last year's when I made it out of cardboard. Hi Debra :) Hee hee...I WISH I had a million little booze bottles, they'd likely be mostly empty though, lol. Hi Christine :) Aack..I'm jealous! Actually tomorrow it's supposed to go up to a whopping 2+ but unfortunately I'm seeing 15 mm of rain, then ice then snow...the full circle! Hi TB :) The calendars are fun. It just adds to the Christmas excitement! I don't know how I'd fare with 21 during the day in December! I complain a lot but I do love all of the seasons! Hi Jenn :) Lol...the boring old chocolate ones are such a temptation for me, then I remember my big old philosophy of being frugal and crafty! :) We're going to buy our tree this weekend I think, I can't wait to decorate, just hoping the cats will decide it's not too interesting this year to climb the tree lol! Thanks Starting Over :) Those little chocolates are really delicious! Hi Harry :) Bad Santa...I think I saw that one, silly movie! I hope you're not too lonely at home! :) But I guess the cats are keeping you busy lol...ours have been surprisingly uninterested in the tree the last 3 years...I hope that trend continues, we're going to get our tree this weekend. I hope your sister in law is getting better, that's such a scary thing. Hi Sam :) Honestly, I found an idea from Martha Steward for the little stockings but I couldn't afford the supplies, I think I got lucky at the dollar store! Those little booze bottles are crazy expensive...I knew someone who collected them from all over the world, I'm sure his collection is worth a good amount now, he never opened them! I will usually only buy a mini one when it's the same as you, for a recipe, I actually have to get some Kirch cherry liqueur for our next fondue night and I hope I can find a wee little bottle. Otherwise it just sits there. What a handful you've got there, and what lovely thoughts. Warm greetings to you. omg...the lineup is too funny! i love your advent calendar! i didn't even put mine up this year. i still don't have my tree up! i am a busy new mama! Wow ,i LOVED your advent dear Rain ! this is so petty and very interesting ! I am sorry that the migraine is still hurting you but as i read in post above thank God you finally found relief my friend! thank you for sharing the photo of storm as never saw such thing before ,it must be frozen out there . Thanks Baili :) It was fun to make that calendar, but so much little detail work, next year I might try something a bit bigger to save my hands! It rained all day yesterday and now it's an ice rink outside...I have to wear cleats on my boots just to get around! 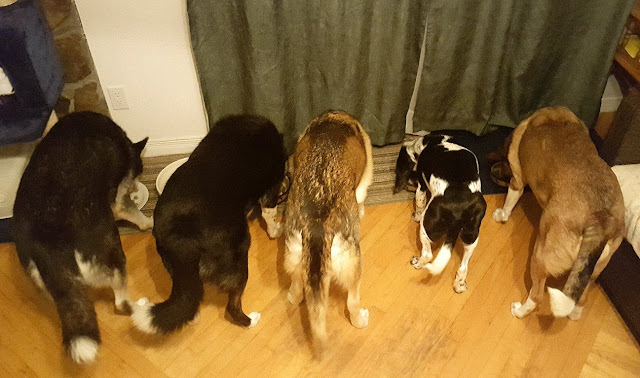 Love seeing the dogs all eating together. Wow, you make an advent calendar every year? That's amazing. HAHA....loving that "end" shot and ending your blog post like that....too cute. Great job on the Advent Calendar. I love it. Nope I don't have one but I did make my daughter a charger plate so many days to Christmas thingy a couple yrs ago. Yes, my Alex used to make advent calendars out of little matchboxes filled with a trinket for each day and then give them to some family in need. She did that for many years and they were always so appreciated. She only stopped as her T.H.I. from the car accident some years ago made it too difficult to concentrate in that way. Wow! that Photo! It does indeed look like something from the end of the world. At first I thought they were trees but then caught it. It's totally like the Upside Down in "Stranger Things" which you prob have not seen but there you go.